Blackness Tower: an enigma at the edge of this world, looking over the sea to the next. Drawing lonely, haunted souls to its ancient riddles, all seeking their own answers among its stones. Ewan Calder is an archaeologist looking for a galleon from the Spanish Armada, one rumored to have wrecked on the rugged Scottish coast. Magnus Anderson is a television presenter looking for proof of the paranormal. Lauren Reay is looking for answers about her family's mysterious past-and about her own compelling dreams. Dreams can't hurt you, she thinks. Neither can her ancestors. The past is past. Or is it? It is Lauren's past, her presence, the shape of her face, the depths of her spirit, that will open the secret at the heart of Blackness Tower. Lillian Stewart Carl's work often features paranormal/fantasy themes and always features plots based on mythology, history, and archaeology. Her novels have been compared to the classic works of Daphne du Maurier, Mary Renault, Mary Stewart (no relation), Barbara Michaels/ Elizabeth Peters, and Tolkien's colleague, Charles Williams--except Lillian's novels take place squarely in the twenty-first century, where the past lingers on into the present, especially in the British Isles. She is the author of fifteen novels so far, including the Jean Fairbairn/Alasdair Cameron mystery series--America's exile and Scotland's finest on the trail of all-too-living legends---which includes The Secret Portrait, The Murder Hole, and The Burning Glass. Of her mystery, fantasy, and sf short stories, eleven are available in a collection titled Along the Rim of Time, and thirteen are collected in The Muse and Other Stories of History, Mystery, and Myth. 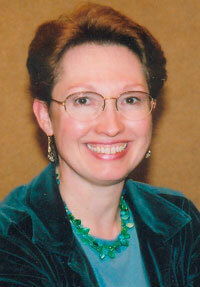 Lillian Stewart Carl describes herself s "a mild-mannered pixel-stained denizen of Texas, a librarian, a historian, and a mother. Not necessarily in that order. I love to read, I've traveled quite a bit (mostly to the UK, but elsewhere as well), and I enjoy quiet hobbies such as knitting, needlework, playing the piano, and tai chi. Although my tai chi instructor is giving the class a more martial arts approach, so if one day one of my mild-mannered heroines slings the bad guy across the room, you'll know why." Stewart Carl started writing wehn she was barely old enough to hold a pencil, let alone know what to do with it. "I've always written, plays, poetry, bits of stories. I actually finished a story for an assignment in high school -- that may have been the first one. I started my first novel on a legal pad when I was laid up in the hospital more years ago than I care to remember. I just can't help following that elusive 'what if' and then expressing it in words. It tells you something that I was in advanced English classes in high school and remedial math classes in college." The author has a distinct subgenre of her own: a blend of mystery/romance with supernatural/historical/mythological underpinnings. She feels it comes from reading eclectically in her younger years. "I like the puzzle aspect of mysteries, the gradual revelation of cause and effect, and I like the emotional resonances of romance, both in the section-of-the-bookstore sense and in the sense of adventure and drama, so that makes me a natural for romantic suspense. "I love to explore that uncertain shore where historical fact meets mythical fancy. None of us are here today without having been there, in the past, whether it's a true past or not. People can be haunted as surely as places can be. The ghosts and visions in my story simply happen externally as well as internally." To make this blend work takes considerable groundwork. "I read a lot of history and archaeology for my facts, and many legends and ghost stories for my 'woo-woo', as they say in the mystery field. Pseudo-history (like the copious material underpinning The Da Vinci Code) is a rich source for me, because the authors will indiscriminately tangle fact and fancy. If only they admitted they were writing fantasy! "I've also traveled to some of the places mentioned in my Scottish novels, leaving a few people rather nonplussed. The Director of the West Highland Museum, where a scene in The Secret Portrait is set, said after she read the book how interesting it was to see themselves as others see them!" Stewart Carl has experienced some near-"woo-woo" of her own. She referes to them as "odd synchronies of the writing life". "The heroine of Ashes to Ashes is a woman named Rebecca, from Missouri, who works at an American replica of Scottish Craigievar Castle. After the book came out, I went back to Craigievar, to be conducted through the house by a woman named Rebecca from Oklahoma. She discovered Jenny Cameron, a one-time associate of Bonnie Prince Charlie, really did die the year before his very late marriage, a fact that ties in exactly to the plot of her novel The Secret Portrait. "I found out after I'd written The Murder Hole that there really is a Pictish cemetery above Loch Ness, very close to where I postulated one for the novel. In the novel she current is writing The Charm Stone , the author named a cat "Bucktrout", an old colonial Virginian name. (Part of the mystery concerns a contemporary Colonial Williamsburg cabinetmaker.) "Only after I set all this up did I discover that a local eighteenth-century cabinetmaker was named Benjamin Bucktrout." The early 1900s house in Fort Worth, Texas, in Garden of Thorns is blown away by a tornado at the end of the book. "The early 1900s Fort Worth house on the cover of the reprint edition," she says, "was barely missed by a tornado the month after the book was published." Only time will tell if Blackness Tower results in any "odd synchronies." 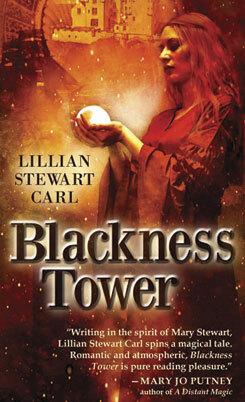 Right now, as Blackness Tower is published, Lillian Stewart Carl is writing the abovementioned The Charm Stone, book four of the Jean Fairbairn/Alasdair Cameron mystery/romance/paranormal series. ("America's exile and Scotland's finest on the trail of all-too-living legends.") She's just finished co-editing (with Martin H. Greenberg) The Vorkosigan Fireside Companion, a retrospective on Lois McMaster Bujold's sf work. It will be published in 2009.